April 19, 2017|Posted in: Happy, Healthy, Smart Kids! Being able to trust your child is a wonderful feeling. Trusting your kids with important tasks or believing they’ll do the right thing, can free you from a lot of unnecessary worry. But just how do kids become trustworthy? Are certain ones just born with a propensity for it or is it a learned trait? While some personalities surely lend themselves more readily to dependability, kids can be taught to be trustworthy! Teaching kids to have good character is easiest when you start in infancy. Then it just becomes their way of life and all they’ve ever known. It was simple to teach our girls to be worthy of trust from the time they were just babies. But what if your kids are older and aren’t as dependable as you’d like them to be? Can you teach them to be more trustworthy? I believe kids can learn to be more trustworthy at any age. We adopted our sons when they were 13 and 14 years old. Of course they’d had training before they joined our family and we admired their character from when we very first met them. But they hadn’t yet learned to trust us or cultivated a desire to earn our trust of them. But I’m happy to report that it didn’t take long at all for the trust to begin to flow both directions. 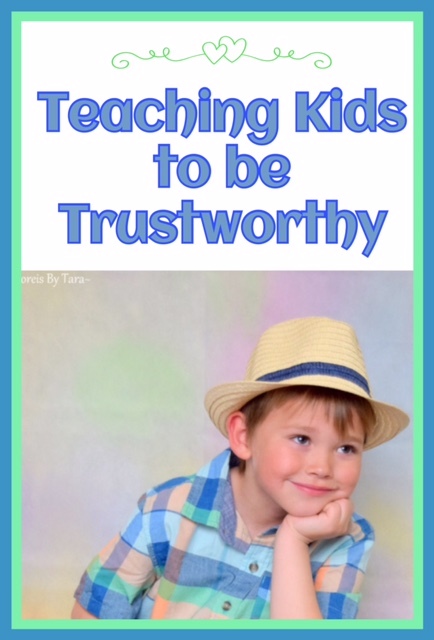 We used the following six steps to teach all four of our kids to be worthy of trust. We’ve also seen lots of success in using this method with many of our students! Some of them had never experienced having someone trust them to succeed. A very important first step is to be a good example yourself. Your kids must be able to count on you in order to learn to be counted upon themselves. Read more about that in this post: Earning Children’s Trust. 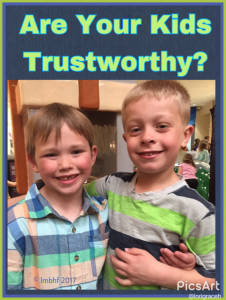 The second step in teaching kids to be trustworthy is to trust them! You might ask how you can trust them if they haven’t earned your trust? You just do! Kids only learn to be worthy of trust when they are trusted. You have to believe in them! Believe they are good and believe that they are capable. Step number three is to talk to your kids. Tell them that they can count on you. Talk about why it is very important for others to be able to trust them. Let them know you believe they’re good and they’re capable. Praise them whenever they show themselves to be dependable. Step four is to share your broken heart with your kids when they break your trust. Compassionately tell them how and why they disappointed you. Remind them why you need to be able to trust them. Talk to them about ways to do better and be more trustworthy next time. Sometimes when your child breaks your trust you’ll need to impose consequences. But parents should always be careful not to be too harsh or critical. For that will always breed deceitfulness. Part of trusting our kids is trusting that they’re human and will inevitably fail from time to time. The sixth step is to provide kids with the opportunity to show themselves trustworthy which will allow them a chance to succeed in your eyes as well as their own. Trust them with an important task or allow them a privilege that requires you to trust in them. When your kids are successful talk about it and let them know how proud you are of them. Repeat steps one through six over and over and over again! That’s how a parent teaches a child, and how a child learns, to be trustworthy. Good suggestions! Cute grandbabies you have there 🙂 Thank you Lori for attending the #WednesdayAIMLinkParty. I shared your post on Facebook, Google+, Pinterest, and Twitter. I love this post. As parents and grandparents, it is our responsibility to ensure that our children have stellar character. It starts at home. Thanks for sharing on Sunday’s Best. « Great Gift – Child’s Name for Baby Shower or Birthday!